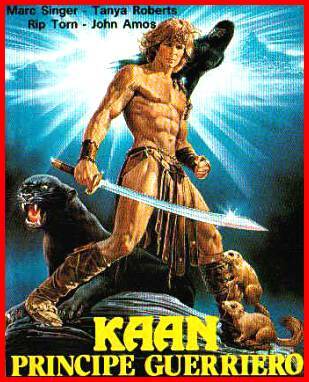 Scheda: Nazione: USA-Germania Ovest (RFT) - Produzione: Beastmaster NV, Ecta Productions, Metro-Goldwyn-Mayer - Distribuzione: Titanus, Domovideo, Metro-Goldwyn-Mayer, Anchor Bay Entertainment, Starlight - Soggetto: Don Coscarelli, Paul Pepperman - Sceneggiatura: Don Coscarelli, Paul Pepperman - Fotografia: John Alcott - Montaggio: Roy Watts - Art Direction: William Strom - Costumi: Betty Pecha Madden - Musiche: Lee Holdridge - Effetti speciali: Frank DeMarco, Roger George, William Guest, Michael Minor - Formato: Metrocolor - Durata: 90' (118'). Cast: Marc Singer, Tanya Roberts, Rip Torn, John Amos, Josh Milrad, Rod Loomis, Ben Hammer, Ralph Strait, Billy Jayne, Janet DeMay, Christine Kellogg, Janet Jones, Tony Epper, Vanna Bonta, Kim Tabet, Daniel Zormeier, Jim Driggers, Mick Thibodeau, Paul Reynolds. Trama e commenti: cinematografo.it - mymovies.it - film.spettacolo.virgilio.it - zapping.35mm.it - cinemafantasy - kataweb.it: «Kaan, biondo figlio di re, va in giro per il mondo a combattere il feroce clan degli Huns. Gli fanno da scorta una pantera nera (la forza), due furetti (astuti ladri) e un'aquila (l'occhio). Il modello è Conan il barbaro con meno talento ma anche senza la sua enfasi magniloquente. La materia è trucida, ma riscattata da un apparato figurativo non privo di suggestione ben fotografato da John Alcott... Piace ai bambini». 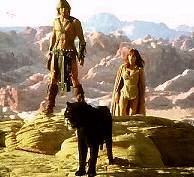 Plot Summary, Synopsis, Review: IMDb - entertainment.msn.com - tvguide.com - coldfusionvideo.com - dvdreview.com - scifilm.org: «Like Conan the barbarian and The Sword and the Sorcerer, The Beastmaster is a coming-of-age tale. 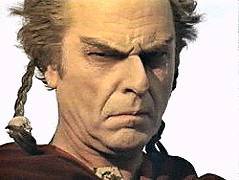 As the story opens, three witches predict that Maax (pronounced May-ax, played by Rip Torn), the high priest of the god Ar, will die at the hand of the King Zed's unborn son. Maax determines to thwart the prophecy by cutting the fetus from the Queen's womb and sacrificing it to the god. However, before he can act, the King (Rod Loomis) discovers the plot and banishes Maax forever. Later that night, one of the witches sneaks into the King's chamber and magically transfers the baby from the Queen's womb into the belly of a cow and disappears before anything can be done. Once safely outside the city, the witch cuts the baby from the cow and begins making preparations to sacrifice it to the god. A traveler (Ben Hammer) overhears the baby crying and kills the witch. He takes the baby (who he names Dar) back to his home village of Emir and adopts it as his own. A few years later...». 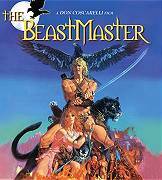 Conosciuto anche con il titolo: Beastmaster: Der Befreier.